Insulating ductwork to help conserve energy has long been an important aspect of energy-efficient-building services design. 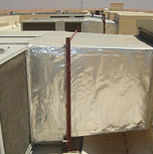 Duct work air leakage also impacts on energy use and carbon-emissions. Our ducting products, EncaSeal and EncaClad will seal existing insulation; ensuring air leakage is kept to a minimum. They will block at least 96% of infrared energy that would otherwise be absorbed by the soft insulation. In a short period of time this energy will break down the surface of most foam insulation, shortening its life and increasing dust levels to unacceptable levels. Encasing with Apollo’s insulation will ensure moisture and heat will not penetrate the ducting. EncaSeal is a tough 130 micron membrane with a LOW EMISSIVITYsurface of only 0.030. It is designed to completely encase and sealphenolic, nitrile, carbon impregnated polyurethane and fibre insulation used on air-conditioning ducts, pipe work and toragetank. The aluminium surface of EncaSeal has a special coating that ensures it’s UV resistant, bright surface never tarnishes. 100% waterproof and bug proof, this Class 0 fire rated material has aValéron® cross laminated core making it difficult to puncture or tear, properties essential for a long working life and keeping wastage to a minimum during installation. 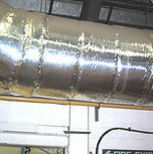 Is designed to encase pipes and duct work. EncaSeal 150PE is a tough 150 micron membrane with a LOW EMISSIVITY surface of only 0.03. It is designed to completely and economically encase and seal fibre insulation used on air conditioning ducts, pipe work and storage tank. EncaSeal 150PE incorporates a12 micron bright aluminium foil chosen to give a pinhole free surface when creased or crushed. The aluminium also has a good “dead fold” property, making the membrane easy to handle on site as it will not spring back. Tests show the finished on the 12 micron aluminium surface of EncaSeal 150PE provides an impermeable barrier that should withstand 20 years of life without corrosion. For external duct work. EncaClad is a durable 345 micron membrane designed to completely encase external insulated or un-insulated structures, pipelines and ducts. It can also be used to clad flat surfaces and large storage tanks. The aluminium surface of EncaClad has a special coating that ensures it’s UV resistant, bright surface never tarnishes. 100% waterproof and bug proof. One side of the sheet is coated with a specially developed waterproof acrylic adhesive with release liner. Once EncaClad is in position, the adhesive is formulated to migrate into the tarnish proof coating, where it sets over a short period of time providing a life-long bond that will resist even high pressure water cleaning techniques. The adhesive has a working temperature range of minus 35°C to plus 127°C. EncaClad is simply cut with a craft-knife and joins sealed with EncaSeal Tape. 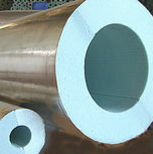 There is no need to fit retaining wire-mesh around pipe-work or have any other protection for the insulation.